Written by an international team of authors the Oxford Textbook of Communication in Oncology and Palliative Care integrates clinical wisdom with empirical findings. It draws upon the history of communication science, providing the reader with a comprehensive curriculum for applied communication skills training. 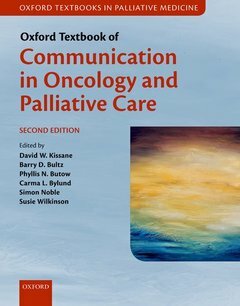 An essential resource, the Oxford Textbook of Communication in Oncology and Palliative Care is filled with tips and strategies for effective communication about difficult and challenging communication. In focusing on cancer and the end-of-life, it deals with the existential and spiritual challenges found across all of medicine, providing deep insights into what is at stake and how clinicians might optimally respond. This authoritative and wide-ranging book provides clinicians with state-of-the-art and evidence-based guidelines to achieve effective, patient-centred communication in the clinical settings of oncology and palliative care. Thoroughly revised and updated, this new edition includes sections on the curriculum for nurses, the core curriculum, and an introductory section on communication science. The chapters embrace specialty issues across the clinical disciplines, from enrolling in clinical trials, working in teams, and discussing genetic risk, to talking about sexuality, infertility, and intercultural issues. An educational perspective is also provided, with chapters covering communication skills training, how to evaluate courses, and international models of training.